Different writers see different stories in the same material. Here's an example of how that works. One of the secondary characters in Murder by Misrule gets into trouble toward the end of the book and goes into hiding. I didn't bother to think where, exactly, for that book. Now I'm writing book 2 and one character asks another about him, so I want to know. Where has he been living? What's he been doing? My characters have lives outside the books and I like to check in now and then, whether they're active in the current story or not. I have the vague idea that this guy is living one of the London liberties, which I don't know much about. They were areas in London, geographically, but outside the reach of the authorities. I thought the Savoy might be one of those places, so I looked it up at British History Online (http://www.british-history.ac.uk/report.aspx?compid=45137), my favorite resource for anything having to do with places. It often gives a century-by-century summary of who owned it and what went on there. Priceless! For some reason I'm in a hurry, so I use my grad-student super-speed-reading powers to scan for dates, seeking my century of interest. Then I spot the phrase "hypocritical ruffians" and I screech to a stop. I adore hypocritical ruffians, as villains, victims, and juicy red herrings. I also love the rhythm of the phrase. So now I have to read this paragraph. Turns out the Savoy was well and truly sacked in 1381 by Wat Tyler and his followers during the Peasant Rebellion, protesting the excesses of John of Gaunt, the Earl of Lancaster, who owned the place. (Now I'm picking up facts from Wikipedia, my favorite quick reference for dates and suchlike.) The Savoy was still a palace back then and the Fleet River was not yet an open sewer. The rebels were determined to destroy the palace along with its egregiously luxurious contents by burning it all to the ground. Unfortunately, they did not know about the gunpowder stored therein. New stuff, gunpowder. Peasants wouldn't know about it. Another bunch of rebels headed straight for the cellar where the sweet wines were stored, another fabled luxury. They got drunk, forgot about the situation at hand, and got themselves trapped inside. That's when I rushed off to do whatever -- I think I was desperately trying to make a deadline at that time. The way I remembered it, those drunken rebels were arrested by the bishop, having foolishly allowed themselves to be locked in a cellar. I'm a nice person; my hypocritical ruffians don't necessarily meet bad ends. But alas, these did. When I re-read the article to write this post, I discovered that they were burned up when their fellows set the palace on fire. That's not funny. I can't use it in one of my light-hearted books. I would have to let the silly sots be arrested. Some of them might even get away to cause some Jack-in-the-Box surprise later on. Actually, one of my protagonists would have to be in there with them, because I don't hand out points of view to just anybody. So they would definitely have to escape. They could wriggle out through the drains and fall into the Thames with bits of burning luxury goods plunking and hissing into the water around them. My brain looks for the absurd, the contradictory, the misruly. My people will step on that banana peel whilst striding toward their destiny. Another writer would focus on the class conflict that fueled the rebellion and the pathos of those poor men, innocently drawn to their first taste of the legendary nectar of the aristocracy, only to be destroyed for their presumption. Another would write about the daughter of John of Gaunt, in love with one of the rebels, desperately trying to salvage her mother's supernatural brooch and rescue her beloved from the chaos before he can be killed or arrested. One article, many stories. The article is history. The stories are what happens to history when it passes through a writer's brain. 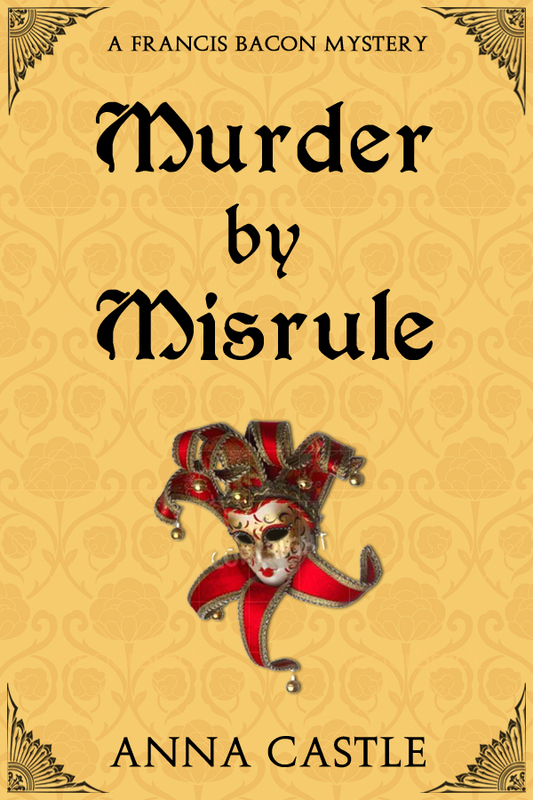 Enter to win a copy of Murder by Misrule by Anna Castle!